This article describes how to enable replication for on-premises VMware VMs, for disaster recovery to Azure using the Azure Site Recovery service. This is the third tutorial in a series that shows you how to set up disaster recovery to Azure for on-premises VMware VMs. In the previous tutorial, we prepared the on-premises VMware environment for disaster recovery to Azure. Set up the source replication settings, and an on-premises Site Recovery configuration server. Set up the replication target settings. Enable replication for a VMware VM. Tutorials show you the simplest deployment path for a scenario. They use default options where possible, and don't show all possible settings and paths. For detailed instructions, review the article in the How To section of the Site Recovery Table of Contents. Make sure you've set up Azure for on-premises VMware disaster recovery to Azure. Follow these steps to prepare your on-premises VMware deployment for disaster recovery to Azure. In this tutorial we show you how to replicate a single VM. If you're deploying multiple VMware VMs you should use the Deployment Planner Tool. Learn more about this tool. 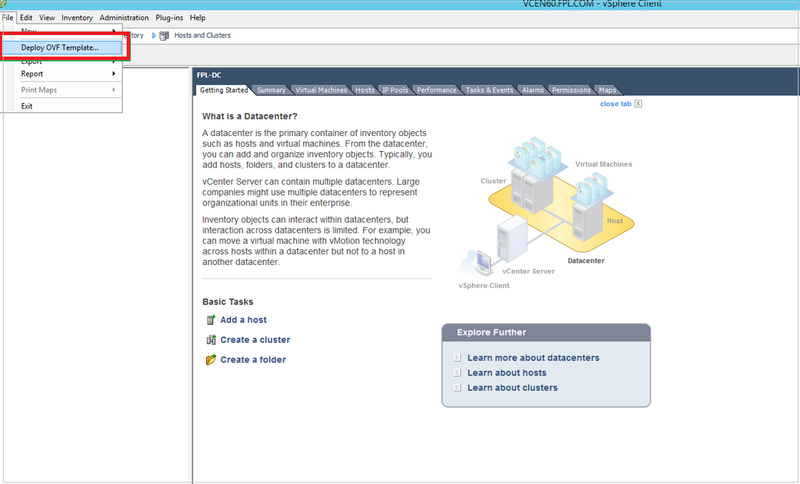 The tutorial uses an OVA template to create the configuration server VMware VM. If you can't do this for some reason, follow these instructions to set up the configuration server manually. In this tutorial, Site Recovery automatically downloads and installs MySQL to the configuration server. If you prefer, you can set it up manually instead. Learn more. In Recovery Services vaults, select the vault name. We're using ContosoVMVault for this scenario. In Getting Started, select Site Recovery. Then select Prepare Infrastructure. In Protection goal > Where are your machines located, select On-premises. In Where do you want to replicate your machines, select To Azure. In Are your machines virtualized, select Yes, with VMware vSphere Hypervisor. Then select OK.
Configuration server: The configuration server coordinates communications between on-premises and Azure, and manages data replication. Process server: The process server acts as a replication gateway. It receives replication data; optimizes it with caching, compression, and encryption, and sends it to a cache storage account in Azure. The process server also installs the Mobility Service agent on VMs you want to replicate, and performs automatic discovery of on-premises VMware VMs. Master target server: The master target server handles replication data during failback from Azure. All of these components are installed together on the single on-premises machines that's known as the configuration server. By default, for VMware disaster recovery, we set up the configuration server as a highly available VMware VM. To do this, you download a prepared Open Virtualization Application (OVA) template, and import the template into VMware to create the VM. The latest version of the configuration server is available in the portal. You can also download it directly from the Microsoft Download Center. If for some reason you can't use an OVA template to set up a VM, follow these instructions to set up the configuration server manually. The license provided with OVF template is an evaluation license valid for 180 days. Windows running on the VM must be activated with the required license. In the vault, go to Prepare Infrastructure > Source. In Prepare source, select +Configuration server. In Add Server, check that Configuration server for VMware appears in Server type. Download the OVF template for the configuration server. Sign in to the VMware vCenter server or vSphere ESXi host with the VMWare vSphere Client. On the File menu, select Deploy OVF Template to start the Deploy OVF Template Wizard. On Select source, enter the location of the downloaded OVF. On Review details, select Next. On Select name and folder and Select configuration, accept the default settings. On Select storage, for best performance select Thick Provision Eager Zeroed in Select virtual disk format. On the rest of the wizard pages, accept the default settings. On Ready to complete, to set up the VM with the default settings, select Power on after deployment > Finish. If you want to add an additional NIC, clear Power on after deployment > Finish. By default, the template contains a single NIC. You can add additional NICs after deployment. If you want to add an additional NIC to the configuration server, add it before you register the server in the vault. Adding additional adapters isn't supported after registration. In the vSphere Client inventory, right-click the VM and select Edit Settings. In Hardware, select Add > Ethernet Adapter. Then select Next. Select an adapter type and a network. To connect the virtual NIC when the VM is turned on, select Connect at power on. Select Next > Finish. Then select OK.
After the configuration server is set up, you register it in the vault. From the VMWare vSphere Client console, turn on the VM. The VM boots up into a Windows Server 2016 installation experience. Accept the license agreement, and enter an administrator password. After the installation finishes, sign in to the VM as the administrator. The first time you sign in, the Azure Site Recovery Configuration Tool starts within a few seconds. Enter a name that's used to register the configuration server with Site Recovery. Then select Next. The tool checks that the VM can connect to Azure. After the connection is established, select Sign in to sign in to your Azure subscription. The credentials must have access to the vault in which you want to register the configuration server. The tool performs some configuration tasks and then reboots. Sign in to the machine again. In a few seconds, the Configuration Server Management Wizard starts automatically. Finish setting up and registering the configuration server. In the configuration server management wizard, select Setup connectivity. From the dropdowns, first select the NIC that the in-built process server uses for discovery and push installation of mobility service on source machines, and then select the NIC that Configuration Server uses for connectivity with Azure. Then select Save. You cannot change this setting after it's configured. In Select Recovery Services vault, select your Azure subscription and the relevant resource group and vault. In Install third-party software, accept the license agreement. Select Download and Install to install MySQL Server. If you placed MySQL in the path, this step is skipped. Select Install VMware PowerCLI. Make sure all browser windows are closed before you do this. Then select Continue. In Validate appliance configuration, prerequisites are verified before you continue. In Configure vCenter Server/vSphere ESXi server, enter the FQDN or IP address of the vCenter server, or vSphere host, where the VMs you want to replicate are located. Enter the port on which the server is listening. Enter a friendly name to be used for the VMware server in the vault. Enter user credentials to be used by the configuration server to connect to the VMware server. Ensure that the user name and password are correct and is a part of the Administrators group of the virtual machine to be protected. Site Recovery uses these credentials to automatically discover VMware VMs that are available for replication. Select Add, and then select Continue. In Configure virtual machine credentials, enter the user name and password that will be used to automatically install Mobility Service on VMs when replication is enabled. For Windows machines, the account needs local administrator privileges on the machines you want to replicate. For Linux, provide details for the root account. Select Finalize configuration to complete registration. After registration finishes, in the Azure portal, verify that the configuration server and VMware server are listed on the Source page in the vault. Then select OK to configure target settings. After the configuration server is registered, Site Recovery connects to VMware servers by using the specified settings, and discovers VMs. It can take 15 minutes or more for the account name to appear in the portal. To update immediately, select Configuration Servers > server name > Refresh Server. Select Prepare infrastructure > Target. Select the Azure subscription you want to use. We're using a Resource Manager model. Site Recovery checks that you have one or more virtual networks. You should have these when you set up the Azure components in the first tutorial in this tutorial series. Open the Azure portal, and select All resources. Select the Recovery Services vault (ContosoVMVault in this tutorial). To create a replication policy, select Site Recovery infrastructure > Replication Policies > +Replication Policy. In Create replication policy, enter the policy name. We're using VMwareRepPolicy. In Recovery point retention, specify how longer each recovery point is retained. For this tutorial we're using 72 hours. Replicated VMs can be recovered to any point in a retention window. In App-consistent snapshot frequency, specify how often app-consistent snapshots are created. We're using the default of 60 minutes. Select OK to create the policy. A matching policy is automatically created for failback by default. For example, if the replication policy is rep-policy, then the failback policy is rep-policy-failback. This policy isn't used until you initiate a failback from Azure. Select Replicate application > Source. In Source, select On-premises, and select the configuration server in Source location. In vCenter/vSphere Hypervisor, select the vSphere host, or vCenter server that manages the host. Select the process server (installed by default on the configuration server VM). Then select OK. In Target, select the subscription and the resource group in which you want to create the failed-over VMs. We're using the Resource Manager deployment model. 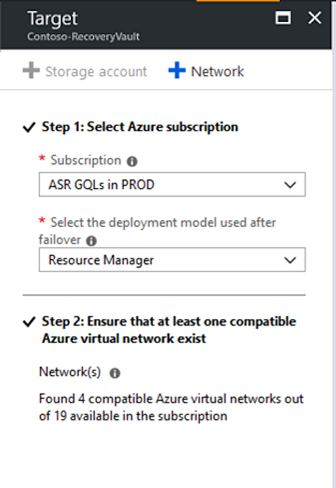 Select the Azure network and subnet to which Azure VMs connect when they're created after failover. Select Configure now for selected machines to apply the network setting to all VMs on which you enable replication. Select Configure later to select the Azure network per machine. In Virtual Machines > Select virtual machines, select each machine you want to replicate. You can only select machines for which replication can be enabled. Then select OK. If you are not able to view/select any particular virtual machine, learn more about resolving the issue. In Properties > Configure properties, select the account to be used by the process server to automatically install Mobility Service on the machine. Select Enable Replication. Site Recovery installs the Mobility Service when replication is enabled for a VM. You can track progress of the Enable Protection job in Settings > Jobs > Site Recovery Jobs. After the Finalize Protection job runs, the machine is ready for failover. It can take 15 minutes or longer for changes to take effect and appear in the portal. To monitor VMs you add, check the last discovered time for VMs in Configuration Servers > Last Contact At. To add VMs without waiting for the scheduled discovery, highlight the configuration server (don't select it) and select Refresh. After enabling replication, run a drill to make sure everything's working as expected.